Once upon a time I was lucky enough to have two separate models pose within the space of 24 hours on the same location. In normal circumstances the drawings would have end up seemingly similar, however, as it turns out, the drawings couldn’t be any different! 1st Lena, where I made one or two pencil drawings taking roughly and hour each, came out looking quite realistic although I would say somewhat masculine, which in reality, is not necessarily the case. 2nd Tempest, the difference is quite apparent. What emerged from this 2 hour draw session was a psychedelic, 3 legged lady thing lying upside down on the sofa, head dangling freely whilst one of her 3 big toes caresses the rim of the bulbous lampshade. The penned piece is so far flung from the previous nights drawing you would be hard pushed to say that it was the same artist who authored them. Had I not just told you. So whats the difference, why the dramatic and sudden change in style? Easily put, the difference was music. On the first occasion I was catching up with a friend as well as drawing a figure, there was little room for music. During the the day prior to next evenings session, I spent the day with a good friend Monsieur MacDonald who so happens to be a member of this so called 'Dream Rimmy" band from Perth. Pretty finger licking stuff that played on my mind until the night. Tempest came to pose and I asked her to sit/lie however she wanted on the couch and then to get comfortable. She took it upon her self to lay her legs over the back of the sofa. Whilst capturing the scene in ink like this, I do not worry so much for proportion or irregularities, I get my one line and I got for it worrying more about creating an atmosphere and sense of the moment rather than fixing mistakes. This leads to fair accurate but absurd looking characters, in this case the third leg arose as I thought to make a "Dream Rimmy" piece out of it, I asked Tempest to imagine herself trying to turn the light "on" with here big toe. The rest is history. What is interesting to note, is that the impression of the lamp is constant in both drawings, this was intentional, I didn't want to mess too much with the for of the lamp, I mean c'mon, its beautiful. Also, in the second drawing, I captured moments of the model walking around the couch eyeing up the perfect spot to place herself, you can see her on the right. 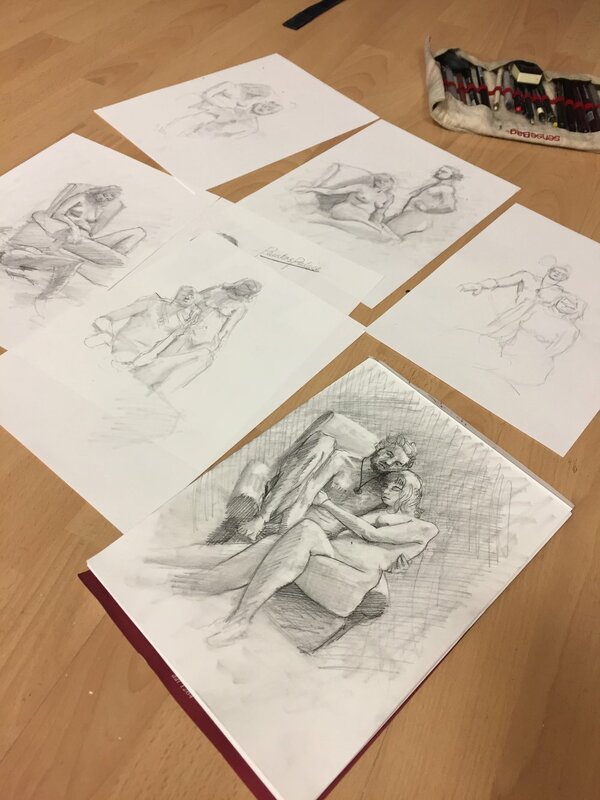 Tonights life drawing session was a mixture of a single and a double model. Working with two models really does double the work load. I find this is due to the increased interactions between intertwining forms and limbs of the body. Despite the extra work the results are much more visually appealing and emotionally charged.